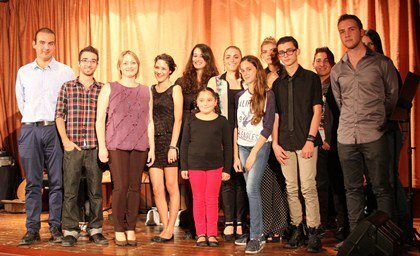 On 7 November 2012, to celebrate National Unity Day, the Russian Centre for Science and Culture (RCSC) in Valletta welcomed me and my students into the Tchaikovsky Hall for a concert of up-and-coming Maltese talent. My students, accompanied by two great musicians – Luke Grech on guitar and Andrew Triganza Scott on piano, put up a fabulous show. To keep up the tradition, I also sang two Russian songs – Nye uhodi pobud so mnoyu and A on mnye nravitsya. I would like to thank Oleg Beglov and his wife Viktoria at the RCSC for constantly giving us such opportunities like these. This entry was posted	on Thursday, November 8th, 2012 at 11:21 am	and is filed under Uncategorized. You can follow any responses to this entry through the RSS 2.0 feed. You can leave a response, or trackback from your own site.